I heartily support this project, which will greatly benefit the Saucon Valley community. I really appreciate the township’s effort to upgrade an existing, older building that houses programs for both young and old. To help keep harmful vaping products out of the hands of minors, the House this week passed legislation that would add “electronic nicotine delivery systems” (ENDS) to the law that currently makes it illegal to sell tobacco products to minors and, for students, to possess or use such products on school grounds. ENDS include, but are not limited to, e-cigarettes, JUULs and vape pens. House Bill 97 now moves to the Senate for consideration. 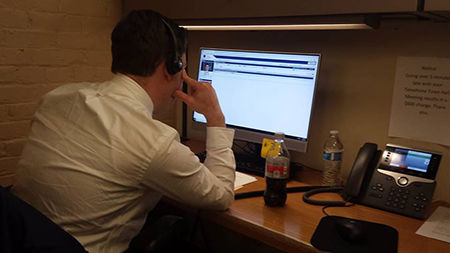 We had a lively discussion with constituents during Tuesday evening’s telephone town hall meeting. The topics included property tax reform, gas prices and lawmaker pensions. I plan to hold another session later this year, so stay tuned! 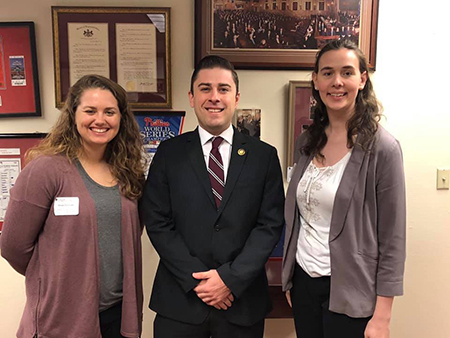 It was my pleasure to meet with members of the National Association of Social Workers on Monday, including one of my constituents, Sarah Kolb (right). 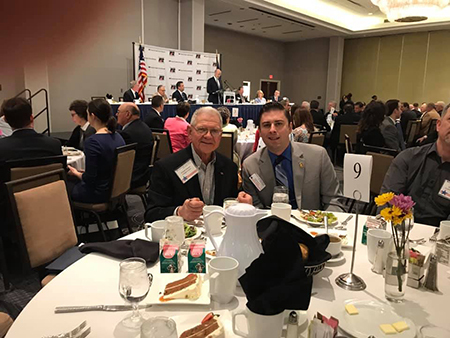 I enjoyed talking with Arland Schantz, who is a constituent, at the Pennsylvania Farm Bureau’s annual State Legislative Conference luncheon on Wednesday. Are you or someone you know interested in a summer job with the Pennsylvania Turnpike? Applications are now being accepted for toll collector, maintenance, clerical and engineering positions. Toll collectors must be available to work any of the three shifts over a 24-hour period, including weekends and holidays. Employees will work a 40-hour week. The pay is $12 per hour for toll collectors, maintenance and clerical and $14.50 per hour for engineering positions. All eligible candidates must be at least 18 years of age and completed a secondary education program such as high school or GED at the time of hiring. The program runs between May 1 and Sept. 30. All summer applications must be completed online at paturnpike.com. Be sure that when completing the application to select “SUMMER WORK” at the first step in the registration process. Copies of online applications should be sent to my Harrisburg office by Monday, April 15.